Sorry, 2019 Pool Membership is full. 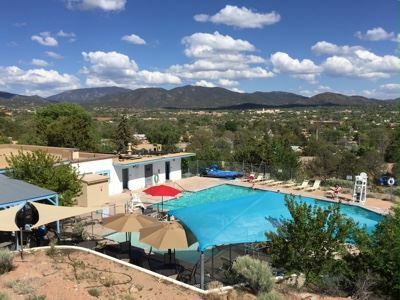 Casa Solana Pool is a community pool that is great for kids and families. Membership is open to everyone, but total membership is limited, so sign up early. The pool is located on the west side of Santa Fe in the Casa Solana Subdivision off of Alamo Drive, across St Francis Drive from the National Cemetery. Open every day from Memorial Day Weekend until Labor Day Weekend (weather permitting). We accept Visa, MasterCard, Discover and American Express for purchases at the pool.